Alumni in Class of 1882 H.S. BY Academy High School Class of 1881 and 1882. Oscar Berglund. Commercial. Certificate in Bookkeeping and Commercial Arithmetic, 1881. Source: The Territorial Enquirer, June 22, 1881, Provo, Utah. ~ ~ ~ ~ BY Academy High School Class of 1882. Oscar Berglund. Graduated June 16, 1882. 21 members of the Class of 1882 are mentioned. Source 1: Deseret Evening News, June 19, 1882. Source 2: Territorial Enquirer, June 21, 1882. ~ ~ ~ ~ O. B. [Oscar Beck] Berglund was born on November 17, 1858 in Fredrickshaven, Hjorring Ampt., Denmark. His parents were Carl Fredrick Berglund and Lucy (Lucie) Maria Beck Berglund. Oscar married Jane Watson Ferguson on April 18, 1917. Jane was born on October 27, 1885 in Dundee, Angus, Scotland. Her parents were John Belches Ferguson and Margaret Tillus Ferguson. Jane died on August 20, 1972 in Ogden, Utah. Her interment, Spanish Fork, Utah. Oscar B. Berglund died on October 23, 1930. His interment, Gunnison City Cemetery, Utah. BY Academy High School Class of 1882. Isaiah M. Coombs, Jr. (sometimes Combs). Graduated June 16, 1882. 21 members of the Class of 1882 are mentioned. Source 1: Deseret Evening News, June 19, 1882. Source 2: Territorial Enquirer, June 21, 1882. ~ ~ ~ ~ Mentioned as a continuing Normal student in the 1881 Principal's Report of Karl G. Maeser, The Territorial Enquirer, Provo, Utah June 22, 1881. ~ ~ ~ ~ Faculty & Staff. Isaiah Combs, Jr., Training School and Drawing teacher, 1883-1884. BY Academy High School Class of 1882, Normal diploma. Sarah Cooper. Graduated June 16, 1882. 21 members of the Class of 1882 are mentioned. Source 1: Deseret Evening News, June 19, 1882. Source 2: Territorial Enquirer, June 21, 1882. BY Academy High School Class of 1882. Euphrasia Cox. Graduated June 16, 1882. 21 members of the Class of 1882 are mentioned. Source 1: Deseret Evening News, June 19, 1882. Source 2: Territorial Enquirer, June 21, 1882. ~ ~ ~ ~ Faculty & Staff, Training School, 1881-1884. Married _____ Miner. BY Academy High School Class of 1882. Selena Curtis. Graduated June 16, 1882. 21 members of the Class of 1882 are mentioned. Source 1: Deseret Evening News, June 19, 1882. Source 2: Territorial Enquirer, June 21, 1882. ~ ~ ~ ~ Selena Charlotte Curtis was born on November 23, 1862 in Payson, Utah. Her parents were George Curtis and Emma Whaley Curtis. She married James Lehi Brown on September 18, 1883 in Salt Lake City, Utah. She died on January 7, 1907, in Payson. BY Academy High School Class of 1882 (secondary) [and 1883 (collegiate)]. Eleazer Evans of Lehi, Utah. Graduated June 16, 1882 with Mercantile Bookkeeping certificate. 21 members of the Class of 1882 are mentioned. Source 1: Deseret Evening News, June 19, 1882. Source 2: Territorial Enquirer, June 21, 1882. 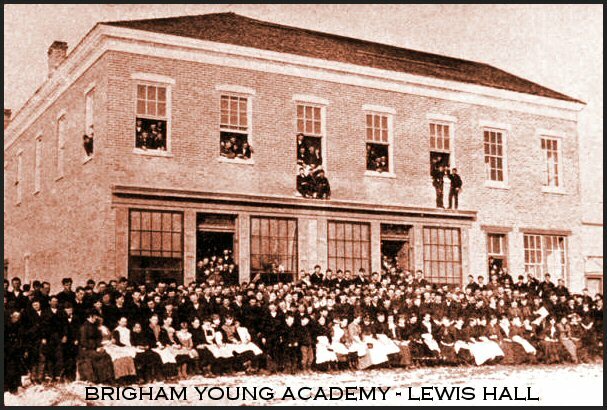 ~ ~ ~ ~ BYA High School Class of 1883. Graduated Friday, June 15, 1883, but with a "collegiate" Normal diploma with an emphasis in Science. Source: Territorial Enquirer, Friday, June 15, 1883. BY Academy High School Class of 1882. Kate Friel. Graduated June 16, 1882. 21 members of the Class of 1882 are mentioned. Source 1: Deseret Evening News, June 19, 1882. Source 2: Territorial Enquirer, June 21, 1882. Faculty & Staff, Training School, 1881-1884. BY Academy High School Class of 1882. Flora Harvey. Graduated June 16, 1882. 21 members of the Class of 1882 are mentioned. Source 1: Deseret Evening News, June 19, 1882. Source 2: Territorial Enquirer, June 21, 1882. ~ ~ ~ ~ Mentioned as a continuing Normal student in the 1881 Principal's Report of Karl G. Maeser, The Territorial Enquirer, Provo, Utah, June 22, 1881. BY Academy High School Class of 1882, Fidelia Kofford, Normal diploma. ~ ~ Faculty & Staff, Delia Kofford, Training School, 1881-1884. ~ ~ Fidelia Kofford (once misspelled Roffoed). Graduated June 16, 1882. 21 members of the Class of 1882 are mentioned. Source 1: Deseret Evening News, June 19, 1882. Source 2: Territorial Enquirer, June 21, 1882. BY Academy High School Class of 1882. Annie Larsen. Graduated June 16, 1882. 21 members of the Class of 1882 are mentioned. Source 1: Deseret Evening News, June 19, 1882. Source 2: Territorial Enquirer, June 21, 1882. BY Academy High School Class of 1882, 1883, 1884 and 1890. Joseph Nelson of Moroni, Utah. Graduated June 16, 1882 with Mercantile Bookkeeping certificate. 21 members of the Class of 1882 are mentioned. Source 1: Deseret Evening News, June 19, 1882. Source 2: Territorial Enquirer, June 21, 1882. ~ ~ BYA High School Class of 1883. Joseph Nelson of Moroni, Utah. Graduated Friday, June 15, 1883, with a Normal diploma. Source: Territorial Enquirer, Friday, June 15, 1883. Also received a Bookkeeping certificate, a Mathematics certificate, and a Physics certificate, on Friday, June 15, 1883. Source: Territorial Enquirer, Friday, June 15, 1883. ~ ~ BY Academy High School Class of 1884. Joseph Nelson. Graduated Friday, June 13, 1884, with a Normal diploma. Source: Territorial Enquirer, Friday, June 13, 1884. ~ ~ BY Academy High School Class of 1884. Joseph Nelson received a certificate of proficiency in Political Science. Source: Territorial Enquirer, Friday, June 13, 1884. BY Academy High School Class of 1890. Joseph Nelson, Bookkeeping. Source: Utah Enquirer, May 23, 1890. ~ ~ Question: Is there more than one Joseph Nelson involved at BYA during these years? BY Academy High School Class of 1882. Annie Page. Graduated June 16, 1882. 21 members of the Class of 1882 are mentioned. Source 1: Deseret Evening News, June 19, 1882. Source 2: Territorial Enquirer, June 21, 1882. Faculty & Staff, Training School, 1881-1884. ~ ~ ~ ~ Anna Maria [or Marie] Page was born on April 26, 1858 in Santaquin, Utah. Her parents were Jonathan Socwell Page, Sr., and Mary Leever Page. She married Samuel Joseph Rich on April 6, 1884 in Salt Lake City, Utah. Samuel Joseph Rich was born on May 1, 1860 in Centerville, Davis County, Utah. His parents were Charles Coulson Rich and Emmeline Grover Rich. He died on December 8, 1916 in Los Angeles,California. His interment, Blackfoot, Idaho. Annie Page Rich died on November 1, 1940 in Logan, Utah. Her interment, Blackfoot, Idaho. ~ ~ ~ ~ [Note: In the 1880 US Census of Provo, Utah, Annie Page is shown as a female, birth year about 1861, born in Utah, age 19, in school, single, and living in the household of "Lafroni Simonde" -- relationship: Other. "Lafroni Simonde" is listed as a female 25-year-old telegraph operator, married, born about 1855 in Utah.] ~ ~ ~ ~ Annie's brother, Jonathan Socwell Page, Jr., served on the BYA Board of Trustees from 1903 until his death in 1918. BY Academy High School Class of 1882. Sarah Robinson. Graduated June 16, 1882. 21 members of the Class of 1882 are mentioned. Source 1: Deseret Evening News, June 19, 1882. Source 2: Territorial Enquirer, June 21, 1882. ~ ~ ~ ~ Sarah Elizabeth Robinson was born December 31, 1863 in American Fork, Utah. Her parents were Edward Robinson and Sarah Elizabeth Harrington. She married Joseph Alma Holdaway [BYA HS Class of 1889] on July 28, 1886 in Logan, Utah. She died on February 14, 1923 in Provo, Utah. Interment, Provo, Utah. BY Academy High School Class of 1882. William Collett. Graduated June 16, 1882 with Mercantile Bookkeeping certificate. 21 members of the Class of 1882 are mentioned. Source 1: Deseret Evening News, June 19, 1882. Source 2: Territorial Enquirer, June 21, 1882. BY Academy High School Class of 1882. George A. Snow. Graduated June 16, 1882 with Mercantile Bookkeeping certificate. 21 members of the Class of 1882 are mentioned. Source 1: Deseret Evening News, June 19, 1882. Source 2: Territorial Enquirer, June 21, 1882. ~ ~ ~ ~ George Albert Snow was born October 31, 1863 in St. George, Utah. His parents were Erastus Fairbanks Snow and Artemesia Beeman [or Beaman]. He married Effie Luvera Stoddard on June 10, 1886 in Milford, Utah. He died on December 15, 1939, in Los Angeles, California. Interment, Los Angeles, California. BY Academy High School Class of 1882 ~ Honorary. Ettie Swarthout. Mentioned as a continuing Normal student in the 1881 Principal's Report of Karl G. Maeser, The Territorial Enquirer, Provo, Utah, June 22, 1881. BY Academy High School Classes of 1882 and 1883. Orvil Thompson. Graduated June 16, 1882 with Mercantile Bookkeeping certificate. 21 members of the Class of 1882 are mentioned. Source 1: Deseret Evening News, June 19, 1882. Source 2: Territorial Enquirer, June 21, 1882. BYA High School Class of 1883. "Arville" Thompson of Scipio, Utah. Graduated Friday, June 15, 1883, with a Surveying certificate. Source: Territorial Enquirer, Friday, June 15, 1883. BY Academy High School Class of 1882. Charles Watkins. Graduated June 16, 1882. 21 members of the Class of 1882 are mentioned. Source 1: Deseret Evening News, June 19, 1882. Source 2: Territorial Enquirer, June 21, 1882. BY Academy High School Class of 1882. William S. White. Graduated June 16, 1882 with Mercantile Bookkeeping certificate. 21 members of the Class of 1882 are mentioned. Source 1: Deseret Evening News, June 19, 1882. Source 2: Territorial Enquirer, June 21, 1882.